Estrada de Ferro Vitória-Minas (EFVM) 1202. 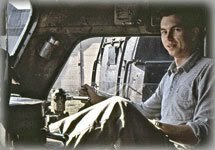 In my quest to locate the longest regularly scheduled railroad operations, I began with the SNIM operation on the Sahara Desert. 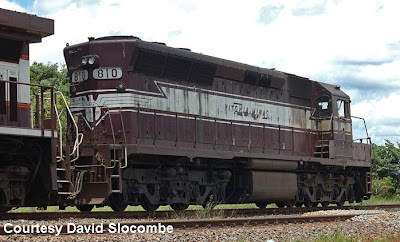 Then I discovered the EFVM, which began operations to service a diamond mining operation in Brazil but has subsequently gone on to be the busiest iron-ore railway, handling 32% of Brazils heavy haul freight. The EFVM is a 562-mile long narrow gauge operation carrying 32% of all Brazilian rail freight. Look carefully, KM fans, they had a Kraus-Maffei ML 4000 on the books! The Trains. EFVM a runs a fleet of modified General Electric Dash 9’s, designated BB40-9W. The GE BB40-9W is a narrow-gauge version of the GE Dash 9 40-CW locomotive. 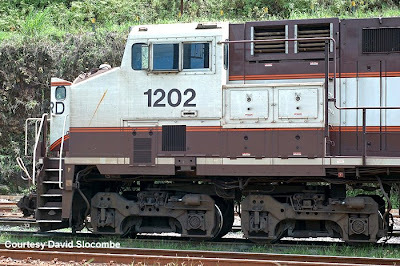 All 141 examples of this locomotive are owned by the EFVM railroad in Brazil, numbered 1113 to 1253. They are equipped with four B-style trucks, replacing the conventional C-style trucks. This is necessary because EFVM is meter-gauge and the standard C44-9W traction motors cannot fit in the narrower trucks. A smaller motor, with an extra axel, allows full application of 4,000 hp to the rails. Working 320 car ore trains is a daunting task! Using distributed power in a combination of a Dash-9 + 160 cars, a Dash-9 + 80 cars, and a final Dash-9 + 80 cars. There is also a fleet of General Motors narrow gauge DDM45’s – an SD45 on steroids, also with four axle trucks. 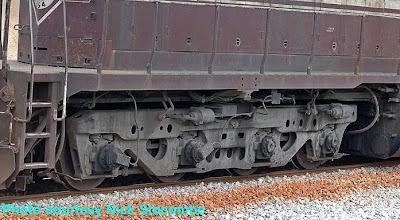 As with the GE locomotives, smaller traction motors of the meter gauge locomotive were unable to handle the full current capacity from the 3,600 HP prime mover. EMD engineered a meter gauge version of the Flexicoil-D four-axle trucks, similar to those found under the domestic EMD DD35, EMD DD35A and EMD DDA40X locomotive model, creating the DDM45 in the process. The additional 2 traction motors of this design allowed full power to be used. My thanks to Nick Slocombe in England for sending me these close ups of the specialized four-axle trucks. 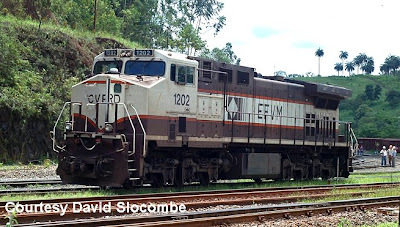 Nick has put together a great photo-essay “Brazil’s Super Railway” with many interesting photos of the EFVM in action. Suggested reading: This article from the International Railway Journal, gives a highly detailed account of the use of distributed power to move these heavy weight trains! Railroad Stuff: EFVM 836, Built by General Motors as Meter Gauge DDM45, 3,600 hp, April 1973, serial number 12618. See Also Longest Ore Trains Part 1.